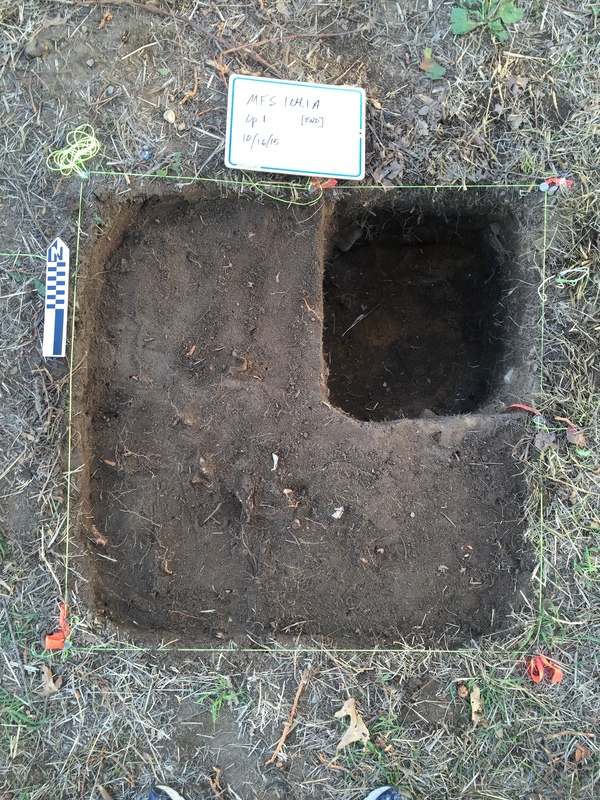 This week’s update on the progress of excavation group one comes courtesy of ANTH60a student, Makalani Mack. Makalani is a Brandeis University undergraduate student majoring in Anthropology. Last Friday during our session at the McGrath Farm site, we ran into a few ‘forks in the road’; for lack of better words. I should start by mentioning that at our session during the previous week, we weren’t able to actually dig because we stumbled on a feature and were not in the ideal conditions to fully excavate it. The feature itself is probably best described as a square-rectangular shaped figure that lies in the Northeast corner of our unit. As we uncovered the tarp from our unit this past Friday, we were welcomed to a large amount of soil dumped back into our unit. Our initial thought was “hey, it rained in the past week so maybe. Obviously some mud seeped through.” However, after digging the soil out and getting back to the bottom of our unit, we noticed something strange. There were two baseball sized holes in the walls of unit. And there lay the evidence of our true culprit for the mysterious dirt pit in our unit: a groundhog! After getting over the frustration, and also fascination, of having a potential groundhog raid our unit, we proceeded to go on with our excavation. Nevertheless, we were soon hit with our next obstacle. To excavate the feature, or expand our unit? That is the question! We could continue investigating what our feature, what it might be, where it came from. Or, we could simply move on to expanding our unit like the other two groups on our site. After a long and tiresome decision process (that actually took no more than about 5 minutes), we decided to expand our unit. It turned out to be a great decision actually. 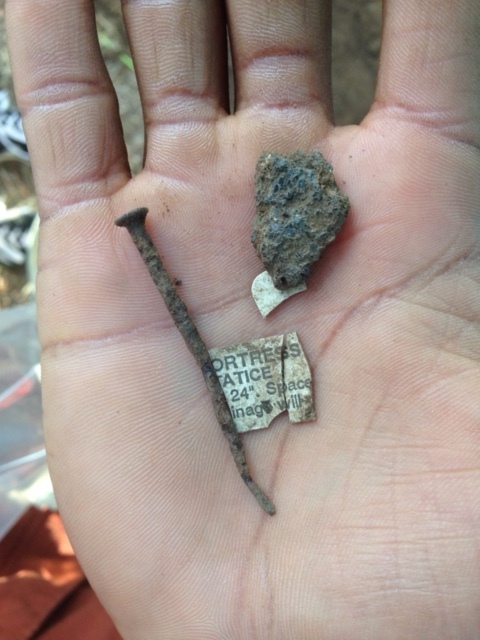 We found traces of coal, nails, ceramic (with writing), brick, and strangely enough; a metal post sticking out of the ground. We documented our findings but since we had a shortened day at the site, we had to get ready to clean up and head back to campus. It was interesting day and I can’t wait to continue excavating our now expanded unit, this upcoming Friday.